Tom P: This week sees the welcome return of Hellboy in Hellboy And The B.P.R.D. 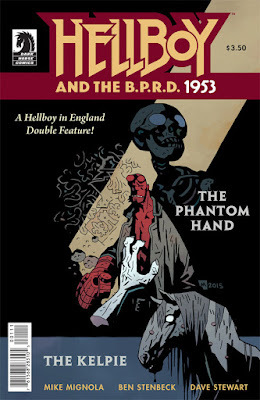 1953 The Phantom Hand And The Kelpie #1, set this time in 1953, covering how he spent some of his second year as a member of the Bureau of Paranormal Research and Defense. The previous arc set in '52 was a real blast; for me, it had all the ingredients needed to make a perfect showcase for this character and the world he inhabits. It effortlessly combined the right mix of pulp and folklore and Alex Maleev put in some brilliant work. This time the artist is Ben Stenbeck who’s worked with Mignola previously on Frankenstein Underground and Baltimore so we should be in for a treat. Its not to late to give Hellboy a go if you haven’t and this is a great way to start! Over at DC, Superman continues to impress me with its bold new direction. Now he’s been exposed as Clark Kent to the world, Superman has publicly declared to bring swift justice to anyone who attempts to go after those close to him. This issue (#45) won’t be drawn by John Romita Jr sadly - my main reason for still reading the book to be honest - so it will be a test to see if it can still grip me. That just leaves Battling Boy: Fall Of The House Of West from Paul Pope who’s teamed up with JT Petty and David Rubin to bring us the sequel to The Rise Of Aurora West and her efforts to solve her mother's mysterious death. Kenny J: Fight Club 2 has been great, which is something to be said for a sequel to a novel that is now almost twenty years old. Chuck Palahniuck has proven he has the particular set of skills needed to tell sequential stories and Cameron Stewart’s art has been inventive as always. I am as excited to see how the battle for Jack’s - or Sebastian as he is now known here - mind and life ends as we move into the third act of the story. And count me in if Palahniuck ever wants to bring this character back for a third story. Next up is Batgirl #45 and it’s everyone’s favourite: a wedding issue. However, it’s not Barbara Gordon tying the knot but more importantly one of the few transgender characters in comics, Alysia Yeoh. At this moment in time there is no one I would rather see drawing matrimonial shenanigans than Babs Tarr. At the other end of the spectrum is Spread, one of those books that doesn’t get mentioned much but has steadily been keeping the quality and gore factor incredibly high.